Colours: Black with Rosewood, Teak or White. This was a variant of the Beomaster 4400 but which had a black fascia instead of the aluminium front seen on the Beomaster 4400. It seemed to be designed mainly for the US market but numbers made seem to be few and it has attained almost mythical status amongst European collectors. Bang & Olufsen themselves have not got one in their collection and in fact did not even have a picture. However the enthusiast is not so easily thwarted! 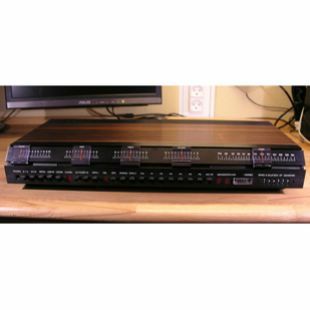 Thanks to the superb investigating powers of Frede Kristenssen of Classic Audio, we present the Beomaster 4401! A more detailed description will follow once the model has been serviced, but essentially it has the same design and performance as the Beomaster 4400. Two of these receivers are known to exist and examination would suggest that these were design studies taken to a production level. Some evidence of prototype wiring is present but clearly the parts are anodised in black. Investigations have not completely uncovered the status of this model. There is one line of thinking which suggests that a number of these were made - in the region of a thousand with the majority going to the United States. However other insiders at B&O suggest that only a handful exist and it would seem that they are now in the hands of enthusiasts. Reports of a matching Beogram , the 4001, are not backed up by any official data and unlike the Beomaster 4401, no service manual has yet been found. In use the Beomaster 4401 is no different from a normal 4400. Except in this case the 4401 was restored by Classic Audio. This means that this Beomaster exceeds all the factory specifications. How does it sound? Very modern despite it being over 30 years old. Lots of power and superb dynamics and extremely neutral. Many Beomasters have a warm slightly veiled sound but this one is a clear as a bell. It works equally well with small and large speakers and is easily able to control the bass on Beovox M100s which are a bit of a handful. The tuner is a delight, pulling in weak stations with ease though the pre-sets are no easier to use than those on the Beomaster 3000. The geared wheels on the Beomaster 2200 are vastly better. Connections are limited to DIN sockets - the useful RCA sockets are no longer there. 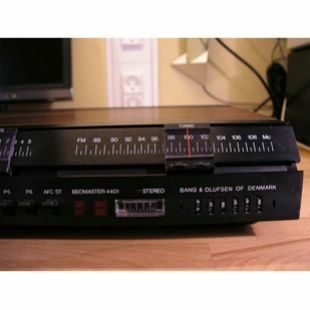 This receiver also was the last to feature ambiophonics and a switch to activate the rear channels was fitted to the rear of the unit where most users would never see it! In this users opinion, this is the best receiver made by B&O. 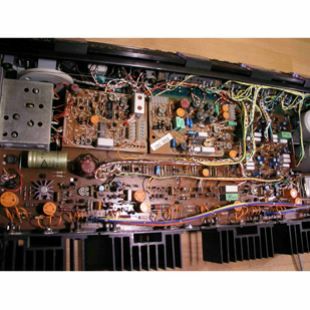 The later Beomaster 8000 was more powerful but the 8000 is prone to going off specification very quickly due to the use of a particular type of capacitor. Therefore an 8000 in proper fettle is a rare beast indeed. The 4400 is therefore a hidden gem; clothed in the skin of the lesser 3000 and 4000, it hides its splendour till called upon to play. Buy one now - these are true bargains!